Every restaurant’s dining room should be unique. 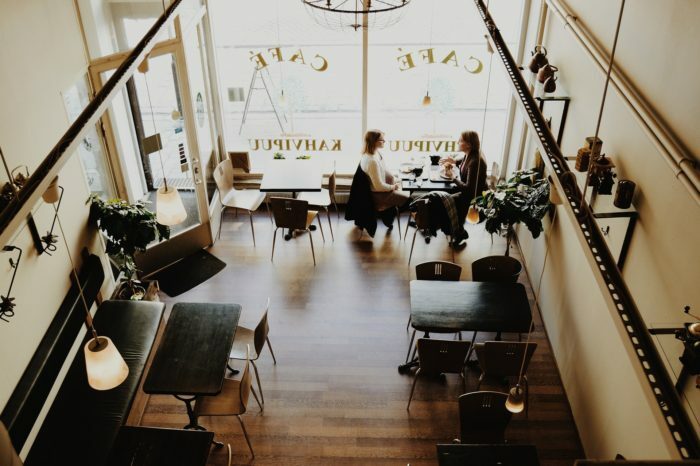 It may not seem obvious, but the layout and organization of your dining room supports your branding and subtly influences your customers spending. So be sure that your dining room and seating layouts are strategically designed. Before designing the layout of your tables and seating, you first need to consider your space limitations and decide how many separate dining spaces you will to create. Multiple main dining areas. You can create multiple dining rooms that flow into each other. Dividing up your dining areas with walls will make it easier to anchor tables. To add an individual charm to each space, you can design each room differently. Open main dining area. You can use a single, large open dining space. Visually and acoustically, this will tend to add an edge of excitement to your dining room, since customers will be able to hear and see all other parties. This kind of space is ideal for floating tables, tables that are not near walls or other fixtures, but you can also add columns to create anchored seating, as well. The columns will have the added effect of enhancing the acoustics in the room. Private dining rooms. You can close off a section or two with double doors, and designate that space as a private dining area. You can use one of the rooms as a smoking area, if local laws allow it. You can also rent out private dining rooms to large groups that want to hold private parties or meetings at your restaurant. If the rooms are not reserved, you can open the double doors and free up the space for walk-in customers. Draw a map of the dining area. Measure the area and draw up a blueprint of the space. Include walls, columns, partitions and any other obstructions in your blueprint. You will use the blueprint to lay out your seating, tables and any other furniture in your dining room. Determine the space between tables. For quick service, there can be less space, since waiters will not be moving much around the dining area. For a casual service restaurant, balance seating capacity with customer and server comfort. Consider the “feel” you hope to create. An “exciting,” casual atmosphere can be a little crowded. With a fine dining restaurant, tables should be spaced further apart to give the diners extra comfort and privacy. Think about party size. Depending on your restaurant type, you may be serving large parties. If you will be expecting large parties, you will need a couple of large tables. If you are not sure what size of parties you will serve, it is a good idea to create a flexible seating layout with extra two-person tables that can be put together or pulled apart to accommodate different party sizes. Booths encourage the highest spending per minute, while tables near a wall or corner also have a high spending-per-minute value. The worst kind of anchored seating to encourage spending is banquette-style seating, where a long bench is set against a wall to be used as the seat back. Strategically place floating tables. You can encourage high turnover with strategically placed floating tables. 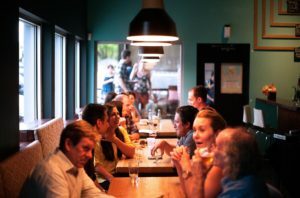 Guests spend less time lingering at tables near busy areas, like the kitchen or the exit, but they spend about the same average on their checks. Thus, the tables that are exposed to high traffic, the “bad” tables, are often the most profitable, earning more dollars-per-minute per customer. However, keep in mind that this will affect the customers’ memories of their dining experiences. While exposed, “floating” tables are often more profitable, they are less likely to encourage customers to come back again. Studies of spending-per-minute at different table locations suggests that it is not necessary to go out of your way to get rid of all the “floating” tables. On the other hand, anchored tables are a key element in making diners feel comfortable and emotionally attached to your restaurant. In the end, the most profitable way to arrange tables is a mix of anchored tables and free-standing tables near high-traffic areas that can be mixed and matched to accommodate different party sizes. 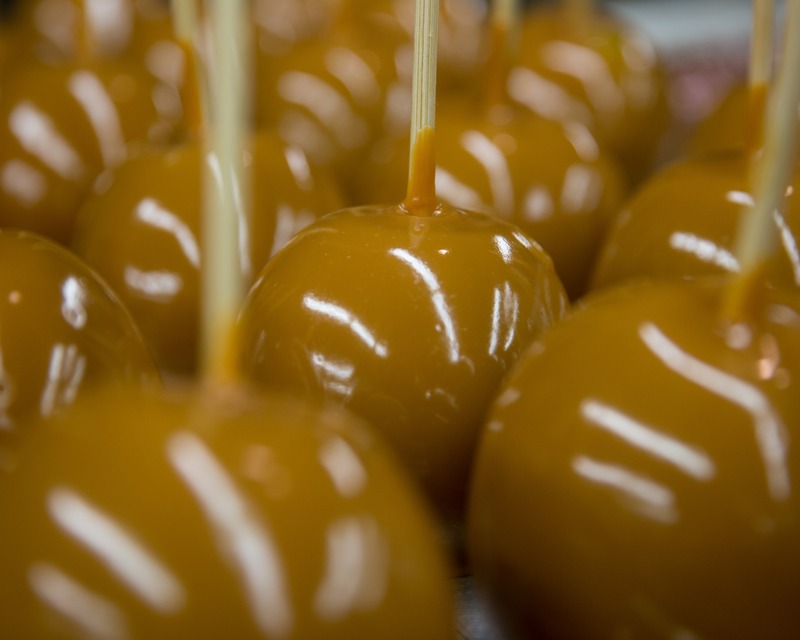 Apple cookers are perfect for caterers, dessert shops, schools and concession stands serving up caramel apples on a daily or weekly basis. Also referred to as apple stoves and apple kettles, these handy machines are easy to use, but do require the operator’s attention when in use. Begin by taking stock of your inventory. You will need the following: Apples, mixture, dipping and setting tools and last, an apple cooker. Firm, fresh picked and un-waxed apples work best. Waxed apples will not allow the mixture to stick. Any variety of un-waxed apples will do, however the most popular varieties include Granny Smith and Red Delicious as they provide a firm skin with a crisp and sweet bite. Be sure to keep all of the apples at room temperature prior to dipping in the mixture. Room temperature apples work best because condensation will form if cold apples are dipped into a hot mixture. The condensation will then prevent the mixture from sticking to the apple and will result in a gooey apple coating. Most apple cooker manufacturers recommend a specific type of pre-made mix, such as Gold Medal Reddy Apple Mix. These mixes come in a pre-measured package and only require mixing in a measured amount of water. Packaged mixes are a great option for busy operators as they cut down on prep time and keep costs down. Other mixture options include melting caramel candies with water or making caramel from scratch. These tactics work great for home chefs or small batches for specialty menus as they are costly and time-consuming for large batch production. To make your candied apples unique from your competitor, consider setting aside a mix of crushed candies, nuts, coconut, sprinkles or chocolate for extra coating. Once your apple is covered in the hot mixture, dip the sticky apple into a dry selection for extra texture and flavor. 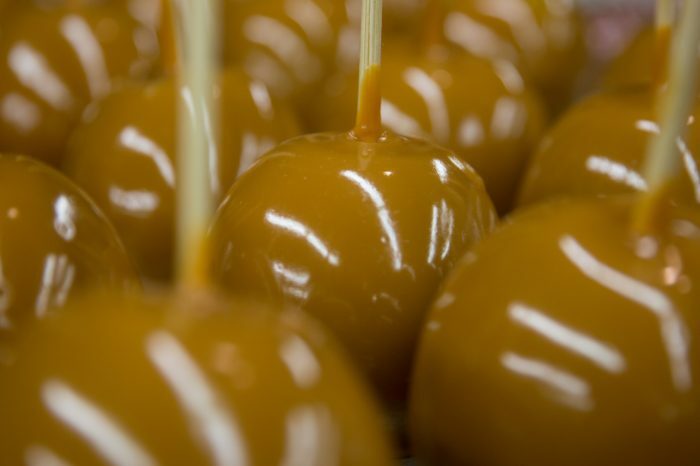 Candy apple sticks are specifically designed to spear the top of the apple. This process can be a little tricky and hazards include receiving splinters from the stick. To avoid this, the apple setter sticker proves an easy ally. Simply place the apple stick into the apple setter, put the apple on top of the setter, press down and the setter guides the stick safely into place. Sheet pans or candy apple pans lined with waxed paper provide a perfectly flat surface for freshly dipped apples to rest. Be sure to have enough sheet pans for your batch to rest without any of the apples touching each other. Oven mitts are essential for handling the hot apple cooker during the cleanup process. Do not attempt to pick up or handle the apple cooker with bare hands immediately after operation. It will be very hot! Now, let’s get cooking! To use the apple cooker, an operator must first read the instruction manual that came with the equipment. This is to ensure that all cooking temperatures are accurate and safe. Although cooking temperatures and batch loads may vary, apple cookers, stoves and kettles operate much in the same way. Plug in the unit and add the measured amount of water indicated in the owner’s manual along with the corresponding amount of packaged mix. Stir the two ingredients together until the mix is thoroughly drenched. Turn the temperature up to high and insert a candy thermometer into the mixture. Continue stirring the mix until it reaches a rapid boil. Once the mixture has reached the boiling point, stop stirring and monitor the temperature until it reaches the desired temperature as indicated in the owner’s manual or on the package of mix. This temperature is commonly 290º Fahrenheit. Turn the apple cooker off once the candy thermometer displays the desired temperature. Pick up an apple that has been speared by the candy apple stick. Do not attempt to coat the apple with your bare hands. The mixture is extremely hot and can cause severe burns. Dip the apple into the mixture and twist it all the way around until the entire apple is covered. Place the finished product onto the sheet pan. Continue until the entire batch of mixture is complete. Place the finished apples into a refrigerated storage space for at least one hour before serving. Follow the instructions in your manual for cleaning your apple cooker. This is often as easy as pouring in water, placing a lid on the cooker and steaming the cooker clean. Be sure to use oven mitts if you need to pick up or maneuver the hot apple cooker at any time. And it’s as easy as that! 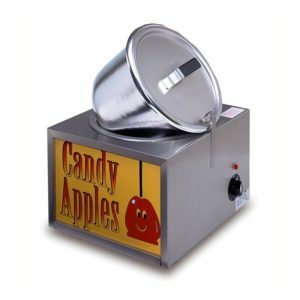 The apple cooker is designed to allow operators to make candied apples quickly and without too much mess. For more tips and tricks, check out the video below from our friends at Gold Medal Products!